Deciduous shrub, erect, loosely branched, 1.5-3 m tall; bark reddish-brown, turning grey and flaking off in patches; twigs glabrous to hairy. Opposite, short-stalked, widely egg-shaped to rounded, 3-5 cm long, margins entire to toothed, flat with 3 major veins from the leaf base, slightly sand-papery to touch. Inflorescence of 3-15 flowers in a raceme; petals 4, white, 5-20 mm long, oblong; calyces top-shaped or bell-shaped, 4-6 mm long, 4-lobed, the lobes egg-shaped, 5-6 mm long; stamens yellow, numerous, unequal. 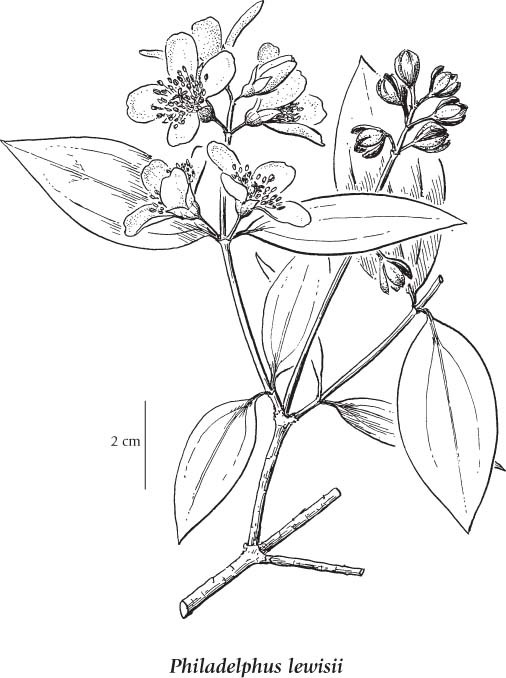 Capsules, 4-chambered, woody, 1 cm long; seeds many, spindle-shaped, brown, 2.5-3 mm long. Moist to dry talus slopes, shrublands, streamsides and open forests in the lowland, steppe and montane zones; frequent in S BC; E to SW AB and S to MT, ID and N CA. A shade-intolerant. submontane to subalpine, North American deciduous shrub distributed more in the Cordilleran than the Pacific region. Occurs in continental cool temperate and cool semiarid climates on moderately dry to fresh, nitrogen-medium soils; its occurrence increases with increasing temperature and continentality and decreases with increasing elevation. Scattered in open-canopy Douglas-fir forests; in the coast-interior ecotone more frequent on water-shedding sites than water-receiving sites. Characteristic of dry continental forests. Philadelphus lewisii var. gordonianus (Lindl.) Jeps.